The article also raises some other important, more general points about choosing and presenting activities to help people with dementia. One of the group participants states that they would like to watch. Rather than bully the person into participating the facilitator offers her a second chance but when the person clearly says that she wants to watch, it is left at that. This is one of the key things that we teach - the Montessori principle of "Choice". Always ask the person if they want to participate, preferably in a way that makes it encouraging ("Would you like to help me with this? ", for example), but if they say no, honor their choice. Another group member says that it is her first time participating. Someone else points to a binder full of the her finished drawings and says "No it isn't". Rather than allow the situation to escalate, which could easily happen, the facilitator says that the person does a lot of coloring in her room and that settles the situation. This is an example of what sometimes is referred as a "noble white lie" - no harm is done by stretching the truth a little, and it simplifies and de-escalates a situation. Accuracy is not the important issue. Dr. Cameron Camp, the researcher who first started using Montessori techniques to help people with dementia, talks about the importance of using things familiar to the person from their past. 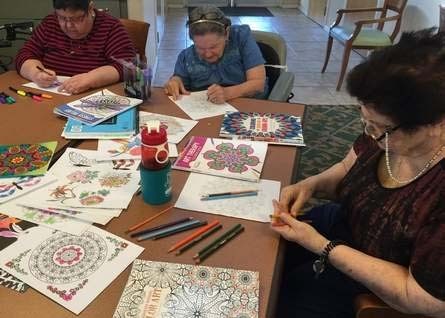 Someone who had a prior interest in drawing, painting or the visual arts will respond better to a coloring activity than someone who didn't have such a background. He says "Enabling people to regain that connection is really an important thing and a great accomplishment. It’s just a matter of modifying the activity so the person can still accomplish things, and tap into that reserve of expertise." This statement embodies many of the Montessori principals that we emphasize in all our training, and tap into with the activities that we create and sell, including the principals of Procedural Memory, Familiar Materials and Adapted Environment. You can read about the Ten Montessori Principals in our Learning Center article. Another important point that Dr. Cameron makes is that the material should be age-appropriate. That doesn't mean that it has to be complex, but it should not be childish. In coloring, an image of a children's cartoon character would likely not be appropriate whereas an image showing wildflowers or an animal such as a rooster likely would be. This concept doesn't just apply to coloring, it applies to all activities such as jigsaw puzzles or reading material. As Dr. Camp says "You want to match the person with the activity, but you want to always remember that this is an adult in front of you."